Make sure you are using the right browser (preferably Chrome or Firefox). Check whether you have allowed access to your microphone. 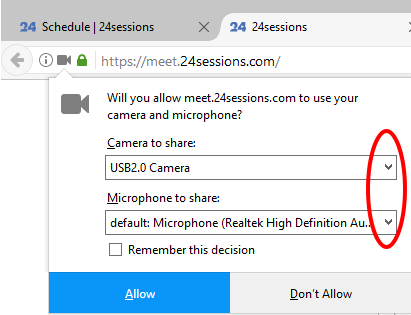 Click on the camera icon in the URL to check whether the right microphone has been selected. Check your volume by right-clicking on the speaker icon in Windows. Select 'Recording devices' to see whether the right microphone has been selected. Download the 'videochat by 24sessions' app. Check whether you are using the right browser (preferably Google Chrome or Mozilla Firefox). Refresh your internet browser by clicking 🔄 in the video chat room (button in the middle, see example below) or in your internet browser (Chrome top left; Firefox top right in search bar). The above issue might appear if you haven't allowed access to your camera and/or microphone. In Google Chrome (top left): the Systembot will provide you with instructions on the left side of the video chat room. The instructions will refer you to the camera icon and settings, which can be found at the top right corner of the Chrome browser (marked with red circles). In Mozilla Firefox (top right): the instructions from the Systembot can be found on the left side of the video chat room as well. The camera icon and its settings can be found in the top left corner of the Firefox browser (red circles). See whether the right microphone has been selected in your web browser by clicking the camera icon as described above (Chrome top right corner; Firefox top left corner). This will take you to the screen below. Click the right arrow from the scroll down menu to see a list of available devices. Make sure to select the right microphone and click 'Allow'. Windows: Use a right-click on the speaker icon at the bottom-right of your computer system (on your computer, not in the internet browser) and open 'Recording devices' as shown in the example below. 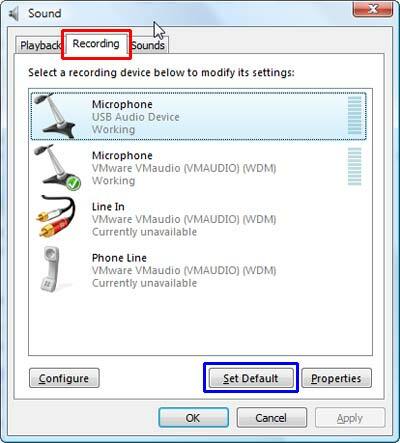 Select 'Recording' to see all available recording devices on your computer. 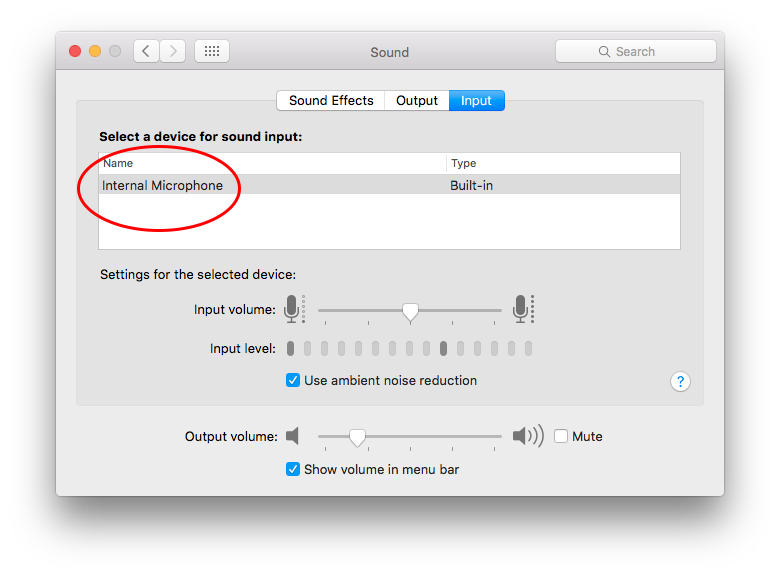 Select the right microphone and click 'Ok' to save your settings (optional: set the correct device as your default to change future settings). Refresh your internet browser by clicking the refresh button 🔄 either in your browser or in the video chat room. 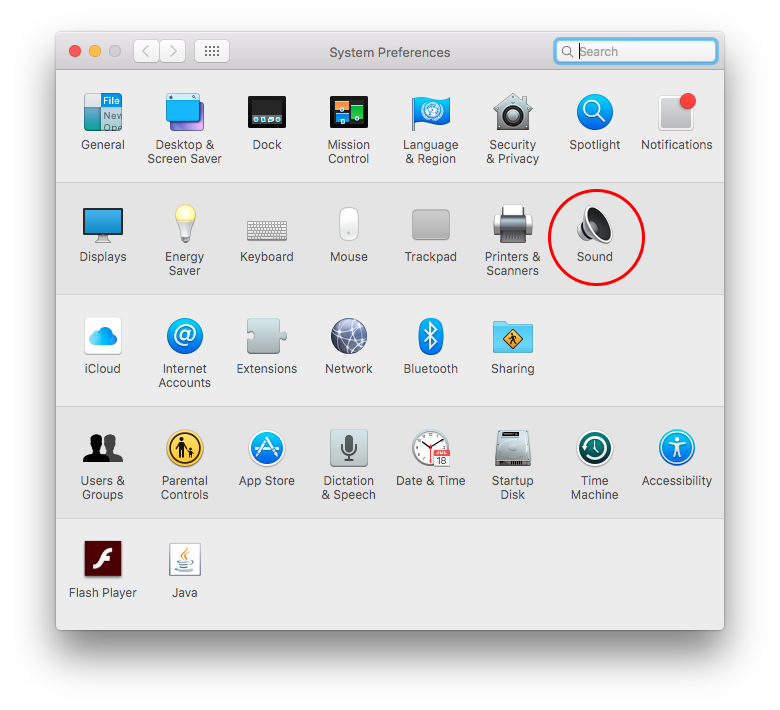 MacOS: Go to your computer settings in 'System preferences' and select 'Sound'. After clicking sound, the right screen below will appear. Click 'Input' and select the right recording device from the list. Refresh your internet browser afterwards by clicking the refresh button 🔄 . If none of the steps above solved your problem, you can always restart your computer to reboot your system.